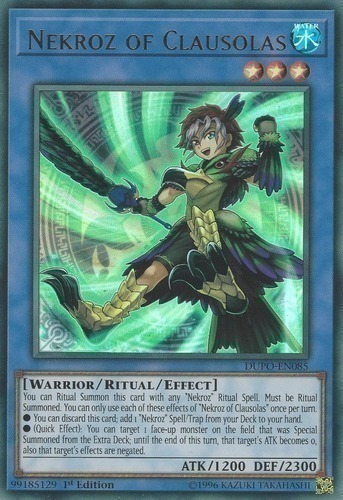 Text You can Ritual Summon this card with any "Nekroz" Ritual Spell. Must be Ritual Summoned. You can only use each of these effects of "Nekroz of Clausolas" once per turn. ● You can discard this card; add 1 "Nekroz" Spell/Trap from your Deck to your hand. ● (Quick Effect): You can target 1 face-up monster on the field that was Special Summoned from the Extra Deck; until the end of this turn, that target's ATK becomes 0, also that target's effects are negated.